India is one of world’s largest industrialized nations with a sizeable pool of technically trained and committed manpower, sound legal system, strong political will and institutional framework based on western business models. Since liberalization in 1991, it has emerged as an ideal location for setting up business ventures for export production. Amongst various schemes for export promotion, the scheme for setting up SEZs and EOUs has achieved remarkable success. This is evident from the fact that the share of SEZ units & Export Oriented Units (EOUs) in the national exports has gone up from 10 per cent in 2004-05 to about 33 per cent in 2017-18. Under the scheme, a SEZ Unit can be set up in any of the seven Government SEZs (erstwhile Export Processing Zones) or in a State / Private sector SEZ while EOUs can be set up outside SEZ across the country as per territorial jurisdiction of concerned Development Commissioner. The EOU Scheme introduced in the year 1981, is complimentary to the SEZ Scheme (Erstwhile EPZ Scheme). It provides the internationally competitive duty free environment for export production and offers wide options in locations with reference to factors like source of raw-materials, port of exports, availability of skilled manpower. 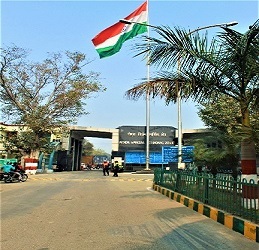 NSEZ the only Central Government SEZ in the northern India, headed by the Development Commissioner, was set up in 1985 in Noida Phase-II on a 310 acre plot of land. Government of India has so far invested a sum of Rs.11149.60 million on its development. NSEZ provides excellent infrastructure, supportive services and sector specific facilities for the thrust areas of exports like gem and jewellery and electronics software. This is the land locked SEZ, contrary to other zones which are situated in Port Towns and hence emphasis of type of units to be set up are those with high value and low volume. Proximity to Delhi and availability of skilled and dedicated manpower makes it ideal for setting up jewellery and software development units. These two sectors have contributed approx 75 per cent of the export turn over during the year 2017-18. NSEZ has maintained high export growth rate for the past many years. Exports from the zone during 2018-19(up to Jan 2019) has been Rs. 83321.10 million. Employment in the zone has gone up from 32550 in June, 2009 to 39338 in Jan, 2019. During the same period, number of operational units in the zone has increased from 245 to 261. Besides, the jurisdiction of Noida Special Economic Zone is spread over State & Private sector SEZs and EOUs in nine states namely Jammu & Kashmir, Himachal Pradesh, Punjab, Haryana, Rajasthan, Delhi, Uttar Pradesh, Uttaranchal and Union Territory of Chandigarh. Exports from EOUs in the jurisdiction of NSEZ in Northern India have been to the tune of Rs. 108619.00 million during the financial year 2017-18. NSEZ has 202 developed plots of varying sizes, besides thirteen Standard Design Factory complexes that can accommodate 208 units including one exclusive block for trading service units. One SDF block of sixteen units is also under construction. Future expansion has been strategically planned and when implemented fully, the zone would be able to provide 224 SDF units.